This entry was posted in Holiday Bootcamp and tagged Animation, High school, Primary School, web design. We all love holidays! No one can tell you the value of a holiday better than kids in primary and secondary schools in Kenya. More so the ones in boarding schools. Its a break from the early morning preps and the strict routine that has to be endured for a whole term. School holidays in Kenya are usually during the months of April, August and December. During these times parents are happy to be reunited with their children but they dread one thing- Idleness! Every parent wants their kids to enjoy the holidays but at the same time they want them occupied with positive activities that engage them mentally and physically so as not to fall into wayward activities, bad company or boredom! This is where the @iLabAfrica Holiday Bootcamp comes in! The @iLabAfrica Hol­i­day Boot­camp is an ini­ti­at­ive star­ted in 2014 for school-going chil­dren in primary and sec­ond­ary schools. The pro­gram seeks to intro­duce IT to children at an early age through fun and inter­act­ive activ­it­ies such as devel­op­ing games, blogs, websites and anim­a­tions using vari­ous tools and technologies. And the icing on the cake- mentorship and career coaching! IT professionals from blue-chip IT firms in Kenya engage the kids offering mentorship and guidance on careers in IT. The bootcamp which ran for the second time this year between 11th and 15th August attracted kids from various primary and secondary schools in Kenya. The young ones were eager to learn right from day one. They worked on group and individual projects on blogging, web development and animations under the guidance of Peter Njoroge, the lead holiday bootcamp instructor at @iLabAfrica. On the final day of the training the kids had developed mind blowing web applications and animations. They were awarded with certificates and prizes for their hard work. One of the best applications was from Mezmure Dawit, a primary school pupil who created a website using WordPress and blog using Wix, about his favorite football team- FC Barcelona, as well as an animated pirates game. Other works of the students can be seen here. Oracle Kenya also provided mentorship and career coaching for the August holiday edition of the bootcamp. “I was impressed to hear one of the pupils ask me for my email address so that he could send me links to his blog and website! It is very encouraging when kids have this kind of exposure to technology and we are very happy to see what @iLabAfrica is doing with these kids” , explained Mr. David Owino from Oracle Kenya. @iLabAfrica hopes to continue offering these holiday bootcamps and improving them to offer school-going children a worthwhile experience during vacation. Refer a child and learn more about the @iLabAfrica Holiday Bootcamp here. 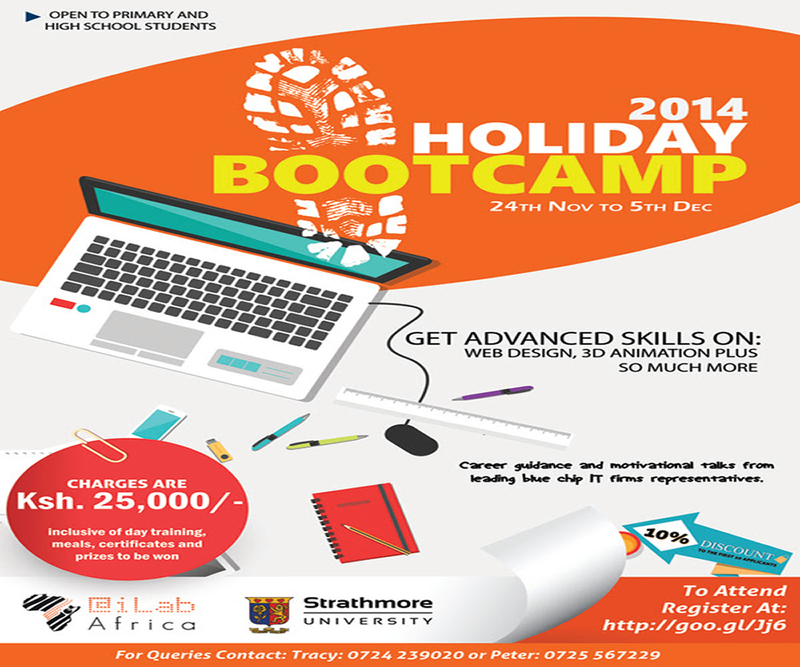 This entry was posted in Featured, Holiday Bootcamp and tagged @iLabAfrica, holiday boot camp, Strathmore University.